Funfurde: roma. mobile. work. unit. I don't draw much of a line between work space and living space anymore. It all sort of blends together, and I tend to look for furniture that blends too. The Roma Mobile Work Unit from G.A.D. does some pretty serious blending, and looks like something I might get a lot of use out of. The name needs a bit of work, though. I can see why G.A.D. 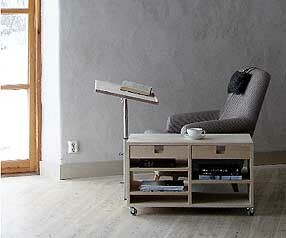 calls this a "unit," since it's not quite a table and not quite a desk, though it has a bit of both in its pedigree. (Tablesk? Deskable? 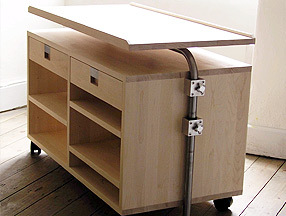 Nah...) The two main features are a table top that can be extended and rotated to use as a work surface, and drawers that can be opened from either side (cool!). Combine those features with some good looks and wheels, and you've got a pretty handy furniture unit indeed. I didn't see a price for this on the G.A.D. site (admittedly, I didn't look very hard), but they do ship to other countries, so at least those of us in the U.S. have a hope of getting one. That's one thing that I've seen on Funfurde that I might actually buy, in place of ogling with no intention of purchase. good day! pls visit http://istambayan.blogspot.com. click on the linkshare box, register and earn additonal money for your blogspot. thank you so much. Now that one is really neat! Could get alot of use from it! Where do you find all this weird furniture! Looks difficult to order in the US. I emailed them but they did not respond.